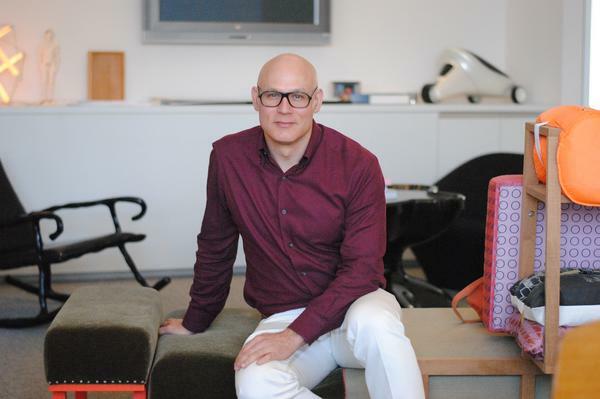 Craig Robins snapped up properties in Miami’s Design District five years ago at about $200 a square foot, and today small parcels in the neighborhood trade for as much as $1,600 a square foot. • The 800 percent increase is a testament to his vision, turning rows of former furniture stores into an ultra-luxury streetscape designed to lure the well-heeled from Interstate 195 on their way to Miami Beach. A recent deal with a large investment partner valued the project at $1.4 billion. Robins is gradually unveiling the transformation he’s led in the compact district, which anchors the west end of the Julia Tuttle Causeway. The Design District has been home to artists, interior decorators and local furniture galleries for years, but the neighborhood was more of a design insider’s delight than a tourist draw. Robins has vowed to change that. Based on the growing foot traffic and the ringing registers in brand-name luxury stores, he’s succeeding. Out-of-town investors have now discovered the Design District, and their deals are driving values higher. Who would have thought 10 years ago that Northeast 39th Street and Northeast 40th Street would command rents second only to Lincoln Road and Bal Harbour? Robins’ success has come from a focus on details. There are big ones, such as neo-futurist architect Buckminster Fuller‘s spectacular Fly’s Eye Dome and Japanese architect Sou Fujimoto‘s glass fins on the façade of Palm Court. There are also small ones like the Miami Design District logo on everything from streetscape banners to umbrellas. Design District valet stations have been positioned every few blocks to feed into the parking garages. Design District designers were selective with the landscaping, too, lining the streets and rooftops with collectible trees at least 30 years old. And to keep it all under a tight watch, Dacra also employs security guards to patrol its streets. Robins has the power to shape all of this because Dacra bought about 70 percent of the neighborhood. It attracted dozens of luxury retailers, mostly in fashion, jewelry and accessories. A handful of the new stores have opened so far. Robins said the majority of the 60 stores in 15 buildings should open by May. In February, Dacra will start construction of another 60 stores that will be ready in 2016. That’s in addition to a 100-room boutique hotel and a 14-story, 70-unit condo building. Dacra also donated land for ICA to build a museum. After the first two phases, Dacra and its partners could build an additional 1.5 million square feet. Chariff Realty Group owner Lyle Chariff, a longtime Design District broker who worked with Dacra, said he recently placed jeweler Roberto Coin into the district’s Atlas Plaza, leasing for $300 a square foot. Robins said the success of the first high-end retailers that moved into the district allowed other retailers to feel confident paying those rents. “We are getting really good rents, but it is a lot less expensive than other places that don’t have this potential,” he said. To make this happen, Robins has pulled a Walt Disney, as far as quietly cornering the market for land. Chariff said Robins walked into his office about four years ago and laid a map on the table with properties he wanted him to purchase for a secretive project. Chariff started knocking on doors and getting them under contract, buying them through multiple LLCs named after Rolling Stones and Beatles songs. After helping revitalize South Beach and Lincoln Road in the 1990s, Robins said he realized that the next logical place for development to grow was across from the beach in the city of Miami. The Design District has a history of arts and culture, plus it’s centrally located and easy to access from I-195, he added. Robins brought the Design Miami event to the district and made it a key player in Art Basel, exposing the brand to an international audience. Executives from many of the high-end retailers attended those events, which led to Dacra’s partnership with LVMH, owner of luxury brands such as Louis Vuitton, Celine, Tag Heuer, Fendi, Bvlgari and Givenchy. LVMH is an investor in L Real Estate, Dacra’s first partner in the project. Many of its brands are now tenants. Chariff said LVMH wanted to expand in the Bal Harbour Shops, but wasn’t getting preferential treatment, so it opted to invest in the Design District. Once the LVMH brands signed up, the door opened for Dacra to speak with brands such as Hermes and Cartier, Robins said. These brands tend to herd together because they draw many of the same customers. He plans to bring at least 10 more eateries to the district. Robins has attracted some big believers. In October, General Growth Properties (NYSE: GGP) and Ashkenazy Acquisition Corp. purchased a 20 percent interest in the project for $280 million – a valuation of $1.4 billion. Now other developers are flocking to the district. Chariff Realty has inked its own deals in the Design District now that its exclusivity period with Dacra expired. Chariff said his company owns six buildings there, with several of them under construction. The largest project is a 20,000-square-foot building with a rooftop deck at 3711 N.E. Second Ave.
Chariff Realty represented New York-based Thor Equities as it shelled out more than $82 million for property in the district in 2014, paying nearly $1,600 a square foot in one recent deal. Small sites have quadrupled in value as investors hope to capitalize on the proximity to Dacra’s project. Chariff Realty broker Mauricio Zapata said Thor Equities will redevelop or renovate most of those properties.